Entire visual novel, all characters, story, setting and plot were determined by a series of polls by people like you! In January, strangers from the internet came together and determined every aspect of it. Voice acting for major scenes. 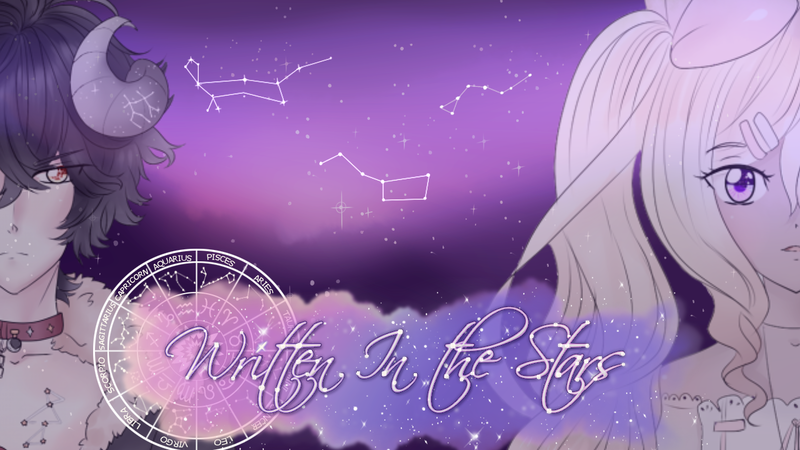 Written in the Stars is a small otome visual novel with two love interests and three possible endings per boy. The format is heavy on reading, but does have choices to make throughout. 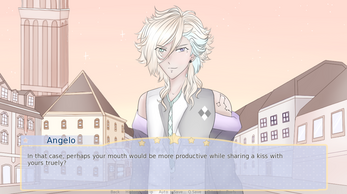 This VN was originally a seven day challenge from January but I ended up expanding the story to be longer and it took over nine months (An actual baby's worth). WitS is a story about burnout and falling out of love with your own work as an artist, so it really was something I needed to write about as a creator myself. 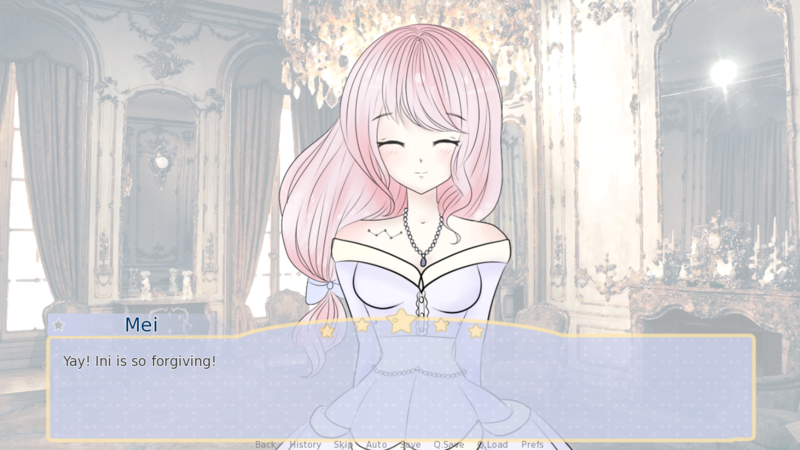 This VN is one that's very personal to me, so its an honour to be able to share it with all of you! There are general writing mistakes. There are some audio errors and level issues. There are some graphical issues and placeholders. There are instances of the story that may be uncomfortable for those who are sensitive to certain topics. Please feel free to contact me if you're concerned about subject matter. This game is a personal project. I released it publicly for others to enjoy but ultimately this game was made for myself alone. Please take it for what it is: a small indie passion project made by one girl about her own mental health. Questions that no one asked but I'm sure will be problems so I included anyway. QTNOABISWBPSIIA For short. "The music is too loud in comparison to the VAing!" The audio maxes when you download the game usually. When you're in-game, click "options" at the bottom of the screen to adjust sound levels! The sound levels are rather off for VAing, something I have to spend a month or so fixing and re-mixing. "How do I know what ending I got?" Make sure you don't skip the credits. If you see an ending listed, you received that ending. If you get an epilogue, you got the true end. "Where do I click 'New Game?'" Hover over the left-most cluster of stars on the title screen. Continue is the right-most cluster. "Why can't I go back? In Paper Roses I could press 'back' to re-play segments!" The back button was removed in WitS because of the nature of the VN. 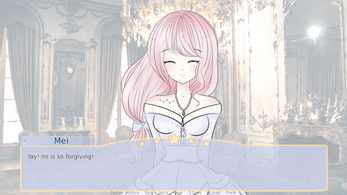 I didn't want everyone to easily get the best ending by going back and re-playing whereas the best ending in Paper Roses was the one definitive canon ending, which is the one I wanted to share most. "Who is the 'canon' love interest of WitS?" Unlike Paper Roses, both love interests hold the same level of validity to the story canon. There is no 'real' choice. They're both equally as canon. "Why can't I re-name Seraphina?" I got this question and it's a great one <3 I just wanted to post my response here in case anyone has the same question. 1. Seraphina's name is a very important part of the subtle lore of the game. 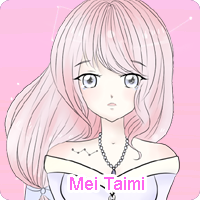 Her name is constantly controlled and changed by the three characters around her and has significance to the important scenes of the game. 2. 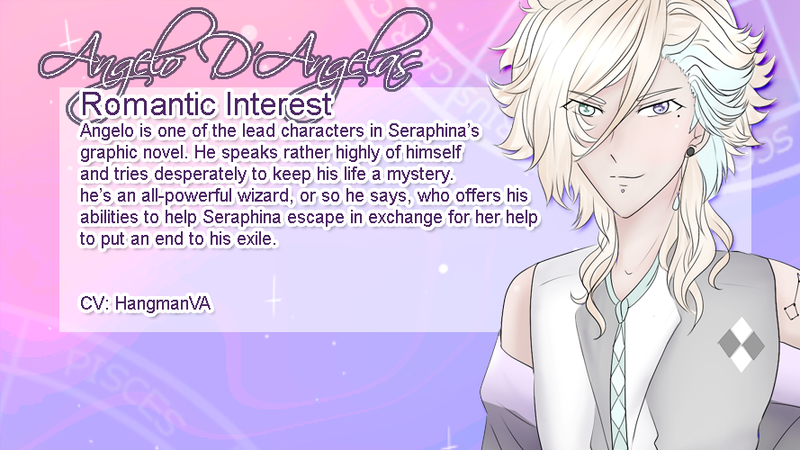 Angelo, Azreal and Seraphina's names all have angelic name origins. 3. 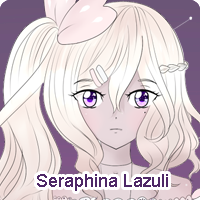 I was very careful to make sure Seraphina isn't a blank slate. She's very much a defined character, as much as Azreal and Angelo. "Is there any content beyond the games?" 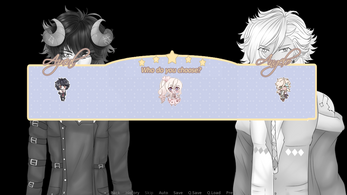 Azreal, Angelo and Seraphina have active presences over Toyhou.se and deviantart. If you're interested to know more about them or see some of the amazing fanart / fanfics of them (One of them inspired a scene in WitS), you can check them out using the links above. Warning, there are spoilers in Azzie's profile. So I just finally got around to playing this game and I absolutely love it. The art is so beautifully done and the story is very addicting and made me want to write again! I love the MC a lot, she's kind of like one of the characters I once made and I can kind of relate to her a bit which is amazing. All in all the story is one of my favorites and I would most likely play it again! Thank you for making this! Thank you so, so much for this lovely message! You absolutely made my month! I'm so happy Seraphina resonated with you so much! Honestly if you're anything like her then you're already an awesome person imo. She's based loosely on one of my best friends! I'm so, so glad you enjoyed the story! That means the world to me. If you do happen to write anything and you're willing to share, please don't hesitate to drop me a message with your work! I'll support the heck out of it! Thank you so much for your kind words! This absolutely made my day! And probably because I'm used to being able to change the MC name in most games... but, aside from that, it's a very nice game. Good job! Hey there Lenneth! I appreciate the feedback! I respect your preference, but perhaps I can shed some light on everything? 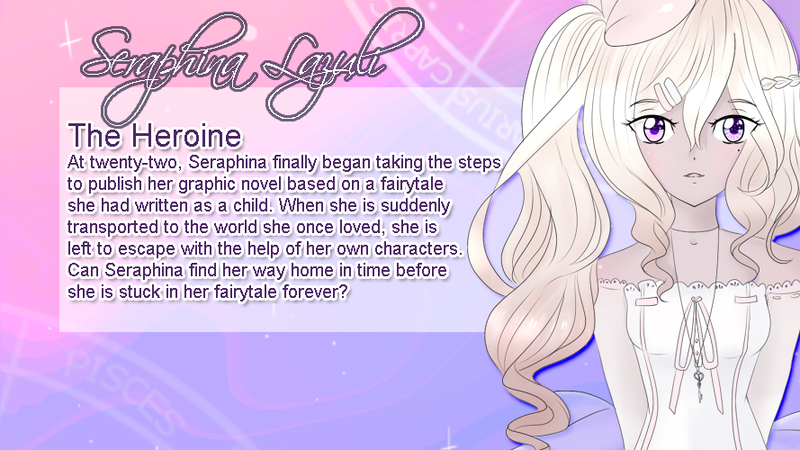 Seraphina's name actually couldn't be changeable, even early into production-- Seraphina's name has a massive role of the game lore. Her name is what it is for a very, very important reason. The entire game was about the power of names, and I felt that by making her name changable I would be undermining my entire message. 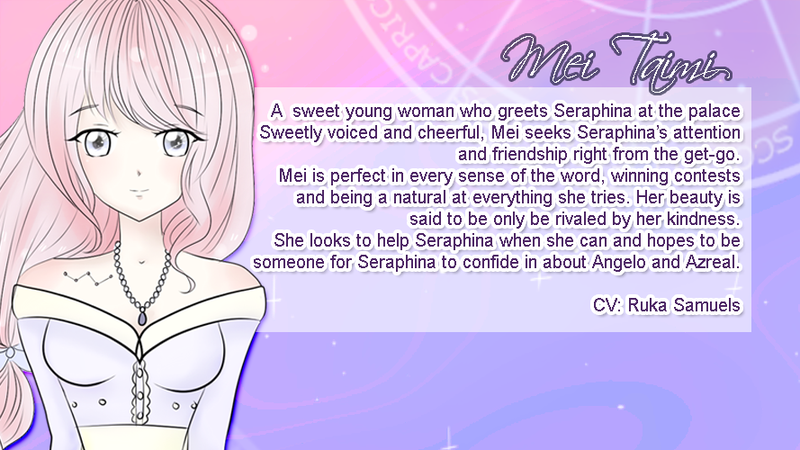 I was very careful to make sure Seraphina wasn't a self-insert or blank slate-- she's very much a defined character of mine so I hope that helps understand my decision a bit more! My OCs are very precious to me, so I appreciate you taking the time to play my small passion project! Anyway thank you so much for playing! I'm glad you enjoyed it despite the name choice not being your cup of tea! I haven't been on itch.io in forever and before I never got to play Written In The Stars I cant wait! You guys-- I'm so, so flattered and so happy. Thank you so much for that Seraiden <3 That honestly means more to me than I could possibly express. ;;;; Thank you for the kind words and support you're the sweetest. Hi, I got that, and the game stopped. What's the problem? YIKES I'm so sorry! I have to look into it and fix it up! I'm so sorry you experienced an error! Basically it's a check if you helped Angelo by using your own abilities to turn the plant to stone earlier on in the game-- but I'm not sure why it's causing an error. You may be able to bypass it by using the skip option on the error screen. I figured out its because I seemingly defined the stupid thing in the wrong place so if you didn't help Angelo and tried to comfort him instead the game doesn't define it. I'm so, so sorry!! I'll add a fix in a bit for it, but you should be able to press 'continue' on the error screen instead. The game started working again only after I pressed "ignore". Nothing else worked. Oh gosh!! Thank you so, so much! That made my morning! I’m so happy you like it so far. I hope the ending doesn’t disappoint 💕 I appreciate the kind words, it means so much to me! Enjoy the rest of the game, and thank you so much for playing! I hope I enjoy your game!! I really hope you do too. Thank you so much for considering 💕 this project means the world to me so I’m so glad I got to share it with everyone. THANK YOU SO MUCH! I'm so glad you enjoyed it! LOL the bad ending is actually a lot better than the medium ending. I'm not sure if you did see it all the way through to the end because the video was cut off before the final screen. 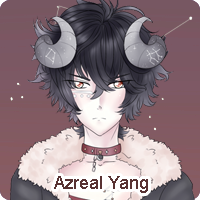 i made you a part two, here is more Azreal. I truly do enjoy this game more than I let on beyond the fangirling and dirty minded cringe feasting I show! OH MY THank you so, so much for the video <3 <3 I'm so happy!! I'll watch it through and see how to fix the error and see if I can do some editing. I'm also sorry for the cringe ahaha Sexuality isn't something I write very well or enjoy writing, but it was part of the challenge. I prefer to write chaste relationships just simply because it's easier to write as someone who's ace. 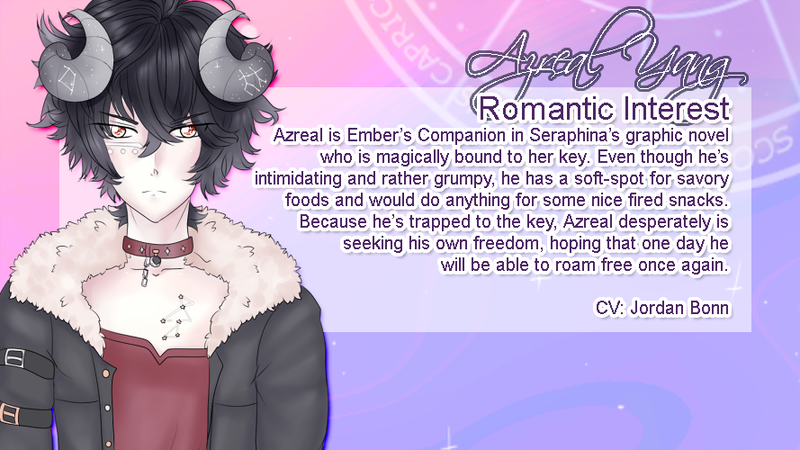 Azreal is actually an incubus in his main story slightly more sexualized than Angelo and I honestly wanted to cut so much of it out but I decided to leave a lot of it ambig. The sexual parts have no real weight in the canon, meaning that the scenes you see are up for interpretation. I hate them 100% too so you're just feeling my cringe while writing tbh. I'm so, so glad you enjoyed it <3 This was great to wake up to. So far I am finding the game quite enjoyable, though I have to say there are a few things down the only route I have finished so far (Azreal) that I would have prefer not happen. But I did enjoy it. Now starting the other route, but came confused by another character popping in, Creed. Can I ask who he is? I understand haha the routes can be pretty problematic to some people, I'm very aware not everyone will agree with where I took the story in some places-- especially in relation to some of the choices I made. I respect that though <3 Thank you for the honesty. 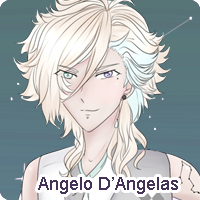 You may, perhaps, run into similar issues with Angelo's, but I hope you still like it! I'm so glad you're enjoying it regardless! I hope those things didn't impact your play through too much. You ran into an easter egg, Creed is a romantic interest from my first visual novel, so it's just a silly cameo for those who played Paper Roses. how do you keep the characters talking in the game? This was an amazing VN and I can't wait for the next one. 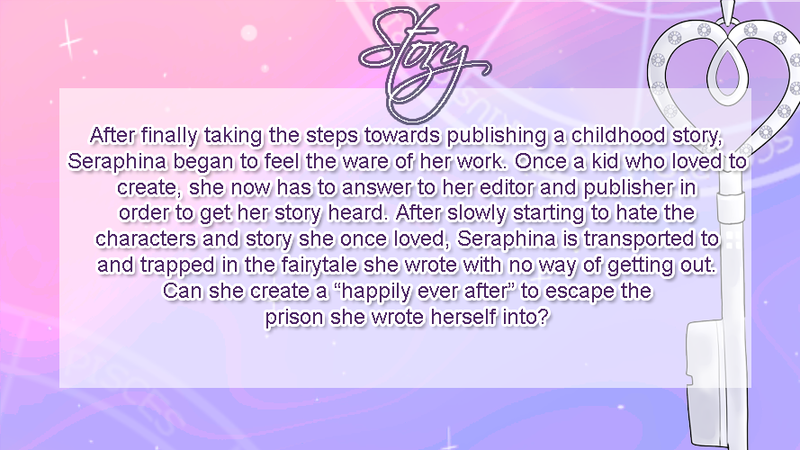 This VN was very helpful for me because I am an aspiring author who is struggling with depression. 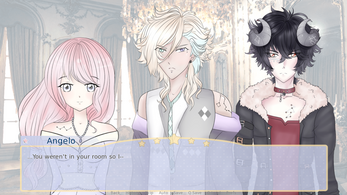 It was also very hilarious and I will never uninstall this game because I LOVE, ADMIRE, OBSESS over this VN so much! I just wanted to let you know that I understand your situation and you absolutely can and will tell those stories you are meant to tell, even if it is in other mediums or other ways that you weren't expecting! When you have some of your work up please feel free to drop me a message and I will be so happy to read and, if you'd like, share your work. OH! and I'm hoping that you could give some tips on drawing. Any style that you like because yours are very beautiful and every time I looked at them they gave me a serene aura. OH JEEZ I'm so sorry! I wrote a reply and I think I forgot to send it! - Use the stablizer if you're drawing digitally with SAI or FireAlpaca. It helps smooth lines~! - I literally could not draw six years ago lol I just practiced everyday until I got better. Even now I struggle with certain pieces. Thank you again! Your comment still brings me so much joy! I can't wait to see what you create! I seriously stayed up till four playing this game... It's really hard to laugh as silently as possible at all the banter! I love this game! Thank you for creating it! I'm so going to recommend this to my friends. Eek, yet another game I'm fangirling over. *embarrassed* I hope you keep making new content, this is great! I played Azreal's route and got "the end". I really enjoyed it! Can you please make a walkthrough? I prefer to follow a guide because I want to achieve every ending, even the bad ones. I'm really curious about the fairy tale and the abandoned ends, but I kinda grow unpatient if I have to try it many times before I get the right answers for the ending. Btw I just need to say this: I really LOVE your art style! You actually made me cry a little bit ;;;;;; Thank you so, so much for playing you made my really awful day honestly a whole ton better. I actually have a crude guide already written (Click for link to google doc) <3 It's rough since it was for the playtesters but green highlight = right answer. 8 or more answers for "The End"
5-7 answers for "Fairytale End"
0-4 answers for "Abandoned End"
I added it to the page so hopefully you can snag some subscribers ;) Thank you so much again! YESSSSS FRIESSSSS! No problem thank you so much for creating this amazing game! I know what it's like to struggle with potato computers. I'm sure you will have a lot of people play and, record this spectacular creation. Thank you once again keep on creating! You're the sweetest ;-; Thank you! You made my day! Thank you so much for playing and recording! Same with you <3 I hope you get lots of subs and views! Hopefully I'll signal boost you a bit as well!